Also serving communities of Broomall. There are 37 Assisted Living Facilities in the Newtown Square area, with 3 in Newtown Square and 34 nearby. The average cost of assisted living in Newtown Square is $4,034 per month. This is higher than the national median of $3,346. To help you with your search, browse the 239 reviews below for assisted living facilities in Newtown Square. On average, consumers rate assisted living in Newtown Square 4.1 out of 5 stars. Better rated regions include Bryn Mawr with an average rating of 5.0 out of 5 stars. Caring.com has helped 5 families in Newtown Square find high-quality senior care. To speak with one of our Family Advisors about assisted living options and costs in Newtown Square, call (855) 863-8283. Seniors who enjoy the great outdoors may find they enjoy exploring the village's many parks and walking trails. The village is home to a large senior population, with more than 23 percent of the village's 18,000 residents aged 65 and over in the 2010 census. Seniors who are mainly independent but need some help with daily activities can find accommodation in one of the 37 assisted living facilities in the area. 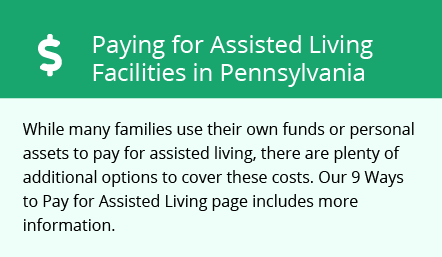 In Pennsylvania these facilities are known as Assisted Living Residences and they're licensed by the Department of Human Services' Office of Long-Term Living. Delaware County, including Newton Square, has mixed air quality. The State of the Air 2018 report gave the county a failing grade for ozone pollution and a "B" grade for 24-hour particle pollution. Seniors with respiratory conditions may wish to investigate how this may impact their health. All forms of retirement income are exempt from state income tax in Pennsylvania for taxpayers aged 60 and over. In addition, sales tax is relatively low in the state. This can help seniors keep their tax bill low and put more money towards their assisted living budget. Newton Square has few facilities from which to choose in the event of a medical emergency or illness, with the nearest major hospital located in Havertown. Community Transit of Delaware County provides a Shared Ride Transportation Program for residents of the county, including Newton Square. Seniors aged 65 and over receive an 85 percent discount on fares. Transport is available within Delaware County and is also provided to some out of county areas on a limited basis. A wide array of community resources for seniors is available in Newton Square, including three senior centers and the County of Delaware Services for the Aging, which coordinates a comprehensive service system for older residents. Seniors in Newton Square can enjoy the arts and culture of Delaware County. The Delaware County Arts Consortium organizes an Arts Week each year. Some assisted living facilities may organize trips to see performances by the Brandywine Ballet Company or the Delaware County Symphony in nearby West Chester. Assisted Living costs in Newtown Square start around $4,034 per month on average, while the nationwide average cost of assisted living is $4,000 per month, according to the latest figures from Genworth’s Cost of Care Survey. It’s important to note that assisted living rates in Newtown Square and the surrounding suburbs can vary widely based on factors such as location, the level of care needed, apartment size and the types of amenities offered at each community. Seniors in Newton Square who receive Social Security benefits may be able to access financial assistance through the Optional State Supplement (OSS). Newtown Square and the surrounding area are home to numerous government agencies and non-profit organizations offering help for seniors searching for or currently residing in an assisted living community. These organizations can also provide assistance in a number of other eldercare services such as geriatric care management, elder law advice, estate planning, finding home care and health and wellness programs. To see a list of free assisted living resources in Newtown Square, please visit our Assisted Living in Pennsylvania page. Newtown Square-area assisted living communities must adhere to the comprehensive set of state laws and regulations that all assisted living communities in Pennsylvania are required to follow. Visit our Assisted Living in Pennsylvania page for more information about these laws.